Target has launched a new ad campaign for its Cloud Island Essentials line, which includes baby essentials “that are designed with love and made without compromise”. 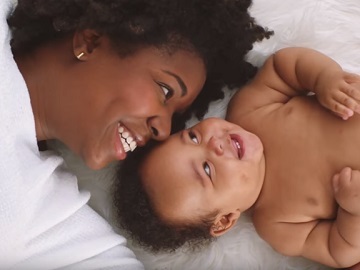 One of the spots included in the campaign is an anthem for the collection, consisting of a variety of products – from diapers and wipes to bathtime and feeding time. The 60-second ad features Robin Beck, a chemist at Target who says she’s been working on baby products for almost ten years and has never seen “anything like this,” referring to the Cloud Essentials line-up of products. Beck says she worked with hundreds of parents to help design and test these baby essentials. “We made Cloud Island Essentials to deliver trusted care at incredible prices. Our diapers have an innovative tri-wrap fold for better fit and powerful leak protection. Transparency is important, so this list of ingredients tells you what it’s made with and why. Our wipes are 99% water and plant-based ingredients. And our gently cleansing shampoo and body wash is made of ingredients parents trust, always made without phthalates and parabens. Two years of research and testing led to tableware with smart details to make mealtime less messy. A great design can make life less stressful. And that’s great for parents and kids. That’s why we say Cloud Island Essentials are Designed With Love and Made Without Compromise,” Robin Beck says. The Cloud Island Essentials is available only at Target.